A large Mid-Western school district was looking to provide multiple views of content in their home economics/cooking class environment. They were looking to provide a mixture of large format displays and projector technology so that everyone in the room could get a good look at the content. They were also using a combination of an HD Camera input and a PC input that needed to be easily switched and distributed. The customer was not interested in connecting two sources to the display devices by using a matrix switch and a complicated control system. The budget constraints required them to use an alternative solution. The alternative solution needed to be easy to install and simple to use by all the instructors. 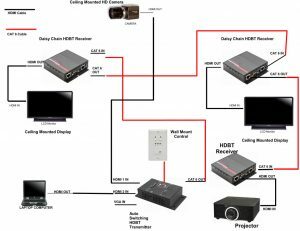 The integrator collaborated with Hall Research to design a solution based around the Auto Switching HDBaseT™ Transmitter. The Transmitter can be set to detect an active signal between the three included inputs and it has one HDBaseT™ output. This Transmitter works with a number of HDBaseT™ Receivers including the Daisy Chainable version. At the teacher’s workstation a simple wall mount control system was installed to switch inputs between the ceiling mounted HD Camera and the teacher’s PC. At each display the Daisy Chainable HDBaseT™ Receivers are used to take in the signal from the teacher’s workstation and send it back out at the same time. Finally at the projector, a standard HDBaseT™ Receiver was used to complete the daisy chain design. Only one single CAT 6 cable was required between all extension and control devices. This solution was less expensive and significantly easier to install than any other system that the school had considered. For more information, contact Hall Research today.